Organizations of all sizes can realize the promise of achieving significant, measurable business value from big data if they establish an information foundation that supports the rapidly growing volume, variety and velocity of data. While the potential value of big data is clear, implementing a high-performance data warehouse solution can pose significant challenges, particularly for midsize organizations that don’t have the same level of budget or IT resources as large enterprises. 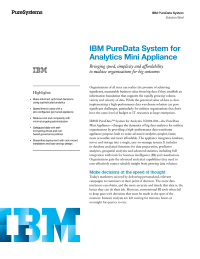 IBM PureData System for Analytics N3001-001 — the PureData Mini Appliance — changes the dynamics of big data analytics by providing a high-performance data warehouse appliance purpose-built to make advanced analytics more accessible and affordable. The appliance integrates database, server and storage into a single, easy-to-manage system. It includes in-database analytical functions for data preparation, predictive analytics, geospatial analytics and advanced statistics, including full integration with tools for business intelligence (BI) and visualization. Organizations gain the advanced analytical capabilities they need to cost-effectively extract valuable insight from growing data volumes. Download this solution brief to learn how to make optimized decisions, speed time to value, reduce cost, safeguard data, and streamline deployment while using analytics.